Rockstar has just dumped an armored-truckload of info about Grand Theft Auto Online, confirming in-game microtransactions and cautioning that the first few weeks might not be all that smooth for the upcoming multiplayer service, which launches on October 1. When GTA Online launches, you'll be able to explore the world and rob stores with up to 15 friends per game, take missions and jobs as a team, and do all sorts of other recreational activities: sports, races, etc. You can create your own personal avatar to use in Los Santos—male or female. There are also four upcoming free updates that will add extra content to the online game, including multiplayer bank heists (!) and a content creator. There will be the typical growing pains for an online game, including but not limited to crashes, glitches, crazy bugs, gameplay modes and mechanics that need re-balancing and other surprises! Even in GTAV Story Mode, some of you may have seen a few odd and even amusing little glitches out there last week. This sort of thing is inevitable in a massive open-world game and there’ll surely be lots more unexpected oddities like this in the Online world next week – rest assured we’ll be monitoring and actively doing all we can to smooth such things out as they happen, but we need your help to find them, as well as your feedback to help fine tune all of the game's systems so everything is perfectly balanced. Although some gamers might be turned off by the thought of other players being able to pay for advantages in the game, bear in mind that you can choose just to play with people you know, and if you so choose, you can all agree not to use microtransactions at all. 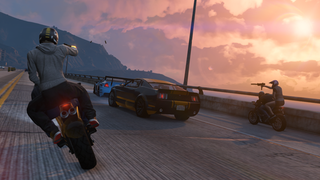 "We are planning for a constant stream of new content, tweaks and updates in the weeks and months ahead," Rockstar writes. "The first couple of weeks we expect to be heavily focused on tuning the experience as it goes from internal testing to the reality of being played by tons of people in the real world so that all the usual teething problems for an online game are overcome. We hope it will all run incredibly smoothly, but please bear with us if it doesn't, and help us fix any and all problems!" The thought of getting together and doing full heists with friends online sure does sound incredible. This will be something to watch.